"Atrocity and terror are not political weapons, and to those who would use them, your day is over. We will never negotiate. We will no longer tolerate and we will no longer be afraid. It's your turn to be afraid." 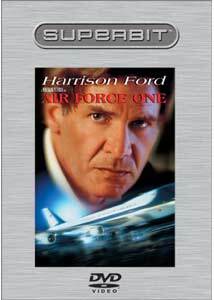 One has to believe that the 1997 blockbuster Air Force One has gotten repeated screenings at the White House in recent weeks. Harrison Ford's opening speech declaring war on terrorism is the clear template for President Bush's address to Congress on the same subject. If only it were so simple that international terrorism could be defeated by a President who can kick booty with the best of them. Of course, having terrorists constitutionally unable to hit the hero would be helpful. President James Marshall (Ford) declares war on terrorism in an unscheduled policy speech in Russia, shortly after having captured renegade Kazakh general Radek, who seeks the reunification of the USSR and a return to communism. Returning to Air Force One, Marshall is no sooner in the air than the Presidential plane is seized by Kazakh terrorists, who were posing as a murdered Russian news crew. The terrorists, led by Gary Oldman, demand Radek's release and threaten to kill the hostages one by one until he is set free. Evading his captors, Marshall, a Medal of Honor winner in Vietnam, has to take on the plane without losing hostages to the terrorists or falling victim to his sentiments as a husband and father thereby negotiating to save his wife and daughter. Despite numerous preposterous turns of event that will leave the head shaking briefly, the viewer readily forgives director Wolfgang Petersen as he takes the viewer on a nonstop ride of action and suspense. Once the bullets start to fly aboard Air Force One (which doesn't take long at all), there's hardly a moment of respite. If things are quiet for a moment, it's only so that Gary Oldman, can be creepily menacing, threatening (and sometimes carrying out) execution of the hostages. Although terrorists who are efficiently brutal at killing somehow manage to miss Ford with automatic weapons, badly straining credibility, Petersen uses the inherent situation deftly to keep a state of white-knuckled suspense throughout. The political subtext of never negotiating is certainly relevant today, as is the realization of Marshall that his human desires to protect his own family leave him vulnerable to extortion. But enough of the politics. This is a review of Columbia Tristar's new Superbit line, and you want to know about the audio and video. So let's move on to what you need to hear. Image Transfer Review: The picture looks fabulous. Fine detail is visible as never before on DVD. Comparing the Superbit to the old single-layer version is not quite night and day, but it will be a huge improvement to anyone with anamorphic widescreen capabilities. The most stunning difference is the night vision sequence at the beginning. Where the original disc is blurry and indistinct, the Superbit version is crisp, clear and full of detail. The older version had significant ringing MPEG compression artifacts throughout, and these are gone completely in the new version. In the dinner speech sequence, the crowd and the tables are full of a detail that was completely lost to indistinctness before. The new level of detail is most easily observed in the actors' hair; blurry suggestions of hair are now rendered perfectly as easily visible individual hairs. Facial expressions are also clearer and nicely rendered. Where the original disc seemed flat, the Superbit version has a palpable depth to it that makes for an increased filmlike experience. Heck, the few speckles on the original are even cleaned off. After the Superbit hoopla, I was surprised to find much of the video bit rate at only about 7 Mbps, until I looked back at the old version and found that it was hovering between 2 and 3 Mbps. The bit rate does indeed make a huge difference. I'm not sure how much of the increased clarity will be visible with downconversion on a 4:3 set, but viewers with widescreen sets will be very happy indeed. Audio Transfer Review: The difference in the audio is not as startling as the video, but it too is much improved. The faint hiss found on the old version is completely gone. Both the DD and DTS tracks sport increased clarity and definition of what was once considered a reference-quality track. The initial gun battle in the plane, wild and frenetic before, is truly hair-raising now; I'm afraid I've traumatized my poor dog beyond therapy. Bass on the older version is muddy by comparison; it is now tight and well-defined on both tracks. The DTS track is mastered somewhat more loudly than the DD, but even after compensating for that, the 754 kbps DTS track seems to have a fuller sound to Jerry Goldsmith's score. In particular, the brass seem both fuller and warmer on the DTS track. Audio is switchable on the fly, so comparisons can be made readily. The DTS version is about as good as I've heard on a DVD, but the DD is not far behind at all. You don't even need to approach reference levels to have a truly visceral response to the audio. Once again, Air Force One is a reference audio track. Extras Review: True to the policy of a Superbit disc, there are just about zero extras. Subtitles are provided in English, French and Spanish, though the English version is plagued with typos. I am glad, however, that CTHV did not skimp on the subtitles; of all extras I consider them the most essential and encourage them to maintain the policy of subtitling in English as well as other languages. Beyond that, there's nothing, not even music on the menu screen. The layer change is absolutely seamless, without even the slightest of hesitation on my Sony player; in a bravura move, CTHV has placed the layer change right in the middle of a shot. Even watching the layer indicator, I cannot detect the slightest pause or hesitation. The informative commentary by Wolfgang Petersen on the original is of course missing here, so fans of the film will probably want to keep both discs; I know that I will. Wall to wall action, in a transfer that will definitely please those with higher end equipment. Detail on the picture is much improved and compression artifacts are gone. The DTS track performs like a Medal of Honor winner. No extras, of course, but for those who disdain extras this will definitely be the version you want.